Tag Archives for " Mark Z. Fortune "
Every local-based business wants to improve their local lead generation process. Leads are the life-blood of your marketing efforts. The best salespeople can convert those leads into sales, but without leads even the best sales force on the planet can’t bring you more business. That is why lead generation is one of my favorite subjects to discuss, and the topic of a new book from a group of my friends and Duct Tape Marketing Certified Consultants called Local Lead Generation: Proven Tips to Help Grow Your Business. My guests for this week’s episode of the Duct Tape Marketing Podcast are Mark Z. Fortune and Kevin Jordan, Certified Duct Tape Marketing Consultants and co-authors (among others) of The Small Business Owner’s Guide to Local Lead Generation: Proven Strategies and Tips to Grow Your Business. We discuss the new book, how to improve your total online presence. What are some of the common mistakes small business owners make? How do I get customers to visit my website? Why shouldn’t you just buy traffic with pay-per-click? John: This episode of the Duct Tape Marketing Podcast is brought to you by MarketingProfs. Do you have the write stuff? Unleash your inner writer by downloading the latest MarketingProfs Marketing Writing Kit for free. You’ll find it in the show notes, but you can go to mprofs.com/ducttape. Hello, welcome to another episode of the Duct Tape Marketing Podcast. This is John Jantsch and my guests today are Kevin Jordan and Mark Fortune. They happen to be a couple of Duct Tape Marketing Consultants who have, with several other Duct Tape Marketing Consultants, written a book called The Small Business Owners Guide to Local Lead Generation. So, Mark and Kevin, thanks for joining me. Mark: Thanks for having us John. John: Well, so I always like to pick on the title first, you know, everybody knows they need lead generation. You guys have stuck the word local in the title and so I wonder is there a difference between local lead generation and just everyday lead generation? Mark: Yeah, well, we felt like there was. I think what happened was there’re five of us who have coauthored the book and in just some of our back and forth and working together in the network, we all sort of realized that we’re all working with clients that are local businesses and sometimes they face some unique and common struggles across just the local spectrum and these days, especially in the online world, you can really narrow down your focus as to who your local market is. So, if you’re a local veterinarian clinic, you’re not really concerned with marketing outside of a three- to five-mile radius of where your business is so there are very specific things, especially in the online world, that you need to worry about in order to bring in the right kind of customers to your business and that’s really where we focus in on the local aspects in this book. John: Yeah, and I’ve actually been doing this for a long time and even before we had the Internet really as a foundational tool or a website at least, and I do think initially there was a feeling that oh, if you’re trying to sell globally, you need to be online and that’s a big deal. But now people shop around the world certainly but they also shop across the street using all these Internet tools so it really has become, I think, hyper important for local businesses. Kevin: Yeah, absolutely, and I would add to what Mark said that in addition to the online elements which are very important these days, there’s a lot of offline marketing tactics that are available to local businesses. A business that’s not particularly local simply can’t use or can’t really use the … and we get into some of those in the book, especially when it comes to direct mail and referrals and those kinds of things. John: Yeah, and I think that’s a great point too because I think a local business, as you pointed out, I think one of the advantages is when they start combining all of these things and so they use their offline tools to drive people maybe online to get more information to then drive them into their store and that’s where I think the real power comes is when you’re integrating all of these things. Mark: Yeah, and it’s so important to keep in mind if you’re a local business owner that probably well over half of your potential customers and ideal customers are carrying a Smartphone that is location aware and they’re searching for your type of business while in the car or in the office and they’re not on a desktop computer doing it. So, that local aspect of what you’re doing and being able to be found quickly by the search engines is just critical these days. John: Well, and also you imagine when you pull your phone out and you’re driving around, you have pretty high buying intent too, right? It’s like I want to find this thing that I’m looking for and I’m going to go buy it right now and so that makes that even more important I think. So, you guys both consult with small businesses. What are some of the common mistakes, maybe just generally when we’re speaking about marketing, that you encounter on a daily basis? Kevin: Mark, you want to take that one first? Mark: Sure, one of the things I see very often across my client base is a real tendency to jump on marketing tactic of the week. Sometimes it’s just of their own research and their own searching and sometimes it’s they’re being sold an advertising program by a vendor and they don’t fully understand but there will be a rush to oh, man, we have to get on Facebook or oh, we’ve got to do paper click or oh, we’ve really got to figure out Twitter this week, and there’s very little cohesive strategy that goes into it. And we all know small business owners are yanked in a million directions at once so it’s hard to really focus on that plan and nailing down really where you want to go and how you’re going to get there. So, I very commonly see a real tendency to just jump on one tactic for a little while. John: Because that would imply something, wouldn’t it? Kevin: Yeah, that would imply something. They get connected with a marketing person who is not fully qualified to do what they’re doing and in fact just last week, I did a consultation with a local independent insurance agency who had just launched a new website and nowhere on the entire website did it say anything about where the business was located. And if you know anything about search engine optimization for local businesses, you know that that information needs to be in multiple locations on every single page of the website. John: Well, the thing that’s funny about that is that’s not just search engine optimization, that’s just good manners. John: I mean, how am I going to find you? Kevin: Yeah, and not only that, but this particular web designer was charging this business owner over $300.00 a month for a “search engine optimization package.” So, I don’t know what was going to be in that package, but it’s kind of like selling someone a car and then telling them that the engine is going to cost extra, and I see this a lot where business owners just don’t know how to hire the right marketing people. And if someone reads this book, if nothing else, I hope what they get out of it is knowing what questions they need to ask before hiring someone to help them with their marketing. John: You speak about, as many marketing related books do these days, a lot about content and in fact, you talk about out publishing the competition. I will say, and you’ve certainly experienced that, I think a lot of small business owners generally are buying that now and understanding the value of that, but it is still probably the hardest work for them. It’s the part that they struggle with the most; I mean how can we make this idea of content marketing something that a small business owner can actually wrap their arms around? Mark: Yeah, I think one of the important things, and something we really try to point out in the book, is to not get intimidated by the notion of content. And I think small business owners tend to think that means they have to stare in front of a blank computer screen with an empty Word doc every Monday morning and figure out how to crank out a thousand words by 9:00 a.m. for a blog post and that’s just not the case. I mean one of the tactics – I have a newer client, a local landscaping service, and when I said content to him, he nods his head because he knows he has to do it but you can tell it’s just overwhelming him, the idea that he has to do all of this. And I say, “Start simply. What are the ten most frequently asked questions your customers ask you on every job you get? Write those answers down. There’re ten blog posts right there.” You can break it down into very common themes and really start to tackle this. John: Yeah, one of my favorites is what are the questions they should be asking you but they don’t know even to ask you but you know that if they ask that or if you were able to provide the information on that, that would help differentiate you and it would help them get to a better understanding. I see you guys and I talk about FAQs and I can’t remember the acronym you used for what I’m talking about now, but I coined the term Frequently Unasked Questions, but then I found the acronym didn’t play very well in some places. Kevin: We call them SAQs, the Should Ask Questions. Mark: I was just drawing that out. I’m like no, that won’t work, hold on. John: Yeah, you don’t want to pronounce it phonetically or something, that’s right, but I think that’s a great point too. And you talk about in the book this idea of repurposing content too. I think that’s another thing that they get intimidated by is to see people are doing video or they’re doing podcasting and oh, my God, how am I going to think of all this stuff and really finding a piece or two of kind of foundational content that really tells your story and sets you apart, I mean it’s not that hard to turn that into eight or ten applications, is it? Kevin: Absolutely not and in fact, this podcast we’re recording right now, a transcript of this could easily be turned into multiple blog posts with very little editing. In fact, one thing that I’m doing right now with the owner of a clinic for weight loss is instead of just writing his blog, what we’re doing is every week I interview him about his own business as if we’re doing a podcast episode and then I can write the blog post using a transcript of that so that it’s in his own voice. But thinking forward and thinking ahead, we’re saving the recordings of those so that if any time in the future he wants to start a podcast, he already has all the podcast episodes ready to go. John: That’s great. That’s such a great technique too for people that find it hard to sit down and type on a blank screen, but boy, you ask them a question or two and they won’t shut up and so I think that that sometimes can be a great way to extract content from somebody. We already talked about the obvious put your name and address on your website, but what are some of the other must-have considerations for a website now that even for local businesses has become maybe the hub of their business? Mark: Well, I think in so many ways, yes, the NAP, the name, address and phone number is absolutely critical to be on a site so that you can be found unlike Kevin’s client that he mentioned earlier. I think it’s also really important if you have multiple locations to create a unique page within your site for each location that also helps drive that local content or those local search results. I think it’s also critical to take into account your community and your surrounding neighborhoods when you’re developing content. Write something unique to the neighborhood you’re in. Write something unique to the community interests or a cause that you may be involved with and that will over time, if you’re consistent with it, really help with your search rankings. And don’t forget to ask your customers for reviews, I mean it’s just so important to manage that reputation online, and five star reviews and thumbs up reviews and great reviews on Google+ and Facebook will really help drive leads and new business into your store. John: Yeah, and I think it’s also a great trust factor. Anymore, we tend to not believe advertising, we tend to not believe a lot of stuff that somebody is telling us about themselves, but we are more likely to believe that five star review even from a perfect stranger. So, I think they certainly are a necessary element in the search game, but I think they’ve become a real important trust signal as well. Kevin: One thing I’d add as far as critical elements of a website, and I’m sure your listeners are well aware of the latest changes to Google’s algorithm by the time this podcast comes out, but the bottom line is if your website is not mobile friendly, it’s going to be more and more difficult for you to rank in search results and so just go ahead and bite the bullet if your website isn’t mobile friendly right now, get a redesign that’s responsive and that conforms to the latest best practices in that regard so that you won’t be slapped by future updates from Google. John: Well, and we talked about it already. I think Mark mentioned the idea, you know, so many people locally, when they’re looking for a business, that’s what they’re using to search so even if it weren’t for the fact that Google was now not going to show your site, I mean it makes such a bad experience for that person that’s on a phone anyway. Mark: Yeah, I have a new client. We’re redesigning their website specifically because of that issue. It’s a veterinary clinic and they have good search rankings. They’re actually pretty good marketers and have a successful business, but 40 percent of their traffic was mobile and the latest Google updates have really punished their traffic and there’s really no way to get around that other than to rebuild your site in a mobile responsive design. You just have to bite the bullet and go for it. John: So, now I have my lovely website up and it’s mobile friendly and it has great content. How do I get people to visit? Kevin: Well, I think the first thing is making sure that when it is built it’s built with all the proper elements of SEO best practices in place so making sure the keyword rich content and the coding is done correctly and all that. That’s Step 1. And then Step 2 is just taking the idea that you preach John about the total online presence where you incorporate your social media, your email marketing, your online advertising, your ratings and review sites and directory listings and have that all working with each other and all pointing back and driving traffic to your website. John: Yeah, and then it’s plain old networking too, right, in the local community working with other businesses, getting links from other businesses, posting content other places that point back to your site. Kevin: Yeah, and we joke in the book that some of the, you know, we talk about the idea of back links and how you can get links from authoritative sites like your local chamber of commerce and your local BNI chapter. In other words, some of those organizations are things that you probably need to be doing anyway and this idea of getting traffic to your website is just even more incentive for you to be participating in your community. John: So, you mentioned a couple of elements of search engine optimization. Are there any particular elements for local search? So, in other words, for that local business, are there some things that are very unique to that local business to show up when I’m in that town searching for whatever you’re selling? Mark: I think what I’ve seen with my clients are reviews tend to be very, very important, and I work with my clients as a part of what they’re doing. And we talk about it in the book that when a customer has had a good experience, work with them to get that email address and ask them for reviews. Take five minutes or take 30 seconds and give us a quick review on Google+ or on Facebook, and that really will help boost up your traffic as folks are searching for your business in that mobile environment. Kevin: It’s also an insurance policy because let’s face it, the customer who has a bad experience with your business is going to be much, much more motivated to go online and leave a negative review than the one who has a great experience. That’s just the ugly truth of it. So, you might say well, I don’t have any negative reviews so I’m not that worried about it, but when you get one, you’re going to be worried about it so why not go out and get five or ten or 15 or 50 positive reviews so that when that negative review does happen, which it will if you’re in business long enough, then it’s just not really that big of a deal because it’s buried by all of the positive reviews. John: So, getting reviews, optimizing your site, writing content, all these things that work over time do take time. Can’t you just buy traffic? John: – surely you get some clients over time that maybe they have more money than time or patience and feel like hey, why don’t we just dive into Google AdWords. What’s wrong with that thinking? Mark: Well, for one, if you don’t know what you’re doing, it can get really expensive really, really fast with very low conversions. I think if you have a good website and a good strategy and a good landing page and someone who really understands paper click marketing that you’re working with, you can start dipping your toes into paper click pretty quickly and generate some decent results. I know two of our coauthors, both Phil Singleton and Justin Sturgis, use that very often with their clients and use it very successfully, but I’ve seen it happen time after time. Somebody thinks they just put in a credit card to Google, into AdWords, and traffic is going to start pouring in. And sometimes traffic does pour in, but none of it converts. If you don’t have a good landing page and a good clear call to action and offer for what somebody’s going to get, you’ll spend a lot of money really fast. Kevin: Yeah, I would say that AdWords or any other form of paper click advertising even though it might get traffic to your site quickly is not a short-term proposition either because even just to do a basic test of whether a landing page or a campaign is going to be successful, I think at least one to two months minimum would be required depending on your traffic volume and the area you’re targeting. So, I see business owners who will do it for a couple weeks or a month and are not satisfied with the results and give up, but they don’t even have a statistically balanced sample in order to judge whether or not it would have been successful. John: I think you both alluded a little bit to this idea of conversion, I mean obviously, once you know if you get X traffic you will get X result then in many cases you can afford to say okay, let’s go buy all that traffic up because we know what it’s worth to us, but what are some of the ways that you would recommend to know what’s working and not working? I mean I think a typical small business even if they feel like their revenue is good, in many cases they don’t really know what’s driving it so how do you find out? How do you measure what’s working and not working online? Kevin: I think the first thing John is to make sure that you have a method in place for tracking it and are looking at that on a regular basis, whether you or the person you’re outsourcing your marketing to, so analytics are hugely important and with online, online anything really, there’s no excuse not to be tracking it well because the tools are there, they’re available and most of them are free. So, that’s Step 1. Mark: I think the other part too is once you have Google Analytics up running in the social world you can see how much engagement you’re getting. You’ve got to dedicate some time to actually analyze what that means and where your new customers came from and understanding your cost to acquire. One of my clients right now is a software and data company here in Arkansas where I’m located, and we spend an hour a month going over all of the month’s analytics and eventually the conversation moves from how many likes did we get or how many shares did we get to okay, how many of those shares turned into somebody that wanted to see a demo or wanted to try a free trial of our product? And the same thing applies to local business to consumer businesses as well. How many people are converting from all the tactics that you’re using? And then you get down to a cost to acquire and you begin to understand what the lifetime value of that relationship is. John: Yeah, and I think so often people are, and I’m guilty of this, you’re very traffic driven, but as a metric, have an understanding what you started to talk about. What are some of the goals of that traffic? What are we trying to get them to do? Even if it’s how many of them are signing up for a newsletter when they come here or converting to signing up for our webinar? And I think too often all people think about is traffic and sale and there are a lot of goals or steps along that journey in between that can and should be measured. Mark: Right and I think it’s important with the local businesses to really understand what you have with your existing customer base. I mean that can really be, you know, probably is your most valuable asset in the company in terms of helping folks you’ve already converted to convert others. So, we really encourage all of our clients to work with your customer base, make sure they have a wonderful experience and turn into those referral partners for you. John: So, the final question and then we’ll wrap up. I know you guys have some resources that you want to share along with the site for the book, and I know you both get this question all the time, what ultimately is the role of social media in local lead generation? Kevin: Well John I think No. 1 is the first principle of social media, and we jokingly talk about this in the book, is to do no harm. So, for a local business that is pressed for time and who thinks I have to be on social media so they go and set up their Facebook page and their Twitter account and their Google+ and all the other places that they want to be and then they post one or two things and then stop. It is actually hurting that business because when someone goes on your Facebook page and sees that the last post there is Happy Thanksgiving 2012, it’s what we call the social media ghost town effect and it makes people wonder is this business even open. Do they respond to requests? So, No. 1, if you’re going to have a profile on a social media platform, you’ve got to post regularly. And No. 2 is the purpose of social media is really to have conversations with your customers. It’s not some place where you post your ads and it’s just like you’d put an ad in the newspaper, take the same ad and put it on your Facebook page. You want to be using it to maybe start a Facebook group for your customers or use it to solicit feedback or something. It’s all about having a conversation, not about pushing out a marketing message. John: Yeah, and I think that’s a great point. I mean I’ve often told people that say I just don’t have time for social media, do something; find some way to serve your customers using it. Just as you mentioned a group or something on Facebook or following them on Twitter, making a Twitter list of them and at least checking in once a day and seeing what your customers are saying. I mean you could find that valuable couldn’t you, and I think a lot of times you’re right, people get caught up in oh, if I’m on Twitter, it means I have to say something witty 12 times a day, and it certainly can have value without you saying a thing. Mark: Well, and I think you touched on something really important there John, which is so much of the time it can start with just listening first because even if you’re not active in the conversation and you haven’t set up your properties, your business and the needs you’re trying to solve are absolutely being discussed. An example I see every day, and it makes me think of this in my business all the time, is my neighborhood has a Facebook group, just all the houses in my neighborhood. And nine out of ten posts, other than somebody’s dog is lost, are who knows a good roofer, good electrician, good plumber, good whatever, name the service that you’d like. And that stuff is a goldmine as a lead generation tool, and while you can’t actively necessarily advertise on those groups, people are talking about the kinds of needs that your business solves out there and you’ve got to be willing to listen and dive into that conversation. And in a couple cases, they did mention the orthodontist, but out there into no man’s land because the orthodontist wasn’t doing what you just talked about and missed, in my opinion, a tremendous opportunity to say hey, you were a great patient and have all of that young lady’s friends and followers know that their orthodontist cared in a moment that was obviously pretty important to that young lady. Mark: Well, and you’re right, and what if you’re the one orthodontist in that town who has really figured that out? Mark: You’re going to be miles ahead of your competition. John: Yep, yep, it was a great demonstration. So, localleadgenbook.com is where you guys have set up shop for the book. And do you want to tell us about some resources that you have there because I know you mention them throughout the book and then also I think you have a special offer for the launch? Kevin: Yeah, absolutely. The resources page we put together is still a work in progress, but now as we get closer to launch, we’re adding more and more links to each chapter so for each chapter in the book, we’ve put links to the resources that we mention in the book and articles that have more content, especially the chapters on SEO and paper click. And by the way, it’s really, really difficult to describe what an anchor text link is in a printed book. John: Yeah, right, right, some things you have to experience online, right, yeah. Kevin: So, for things like that we have additional resources on the website that people can use to help them. And then we’ve also put together what we feel is a really great bonus package for people who buy the book and come to the site and provide a proof of purchase so we have a bonus chapter on video marketing which I think is becoming more and more important even for local businesses. Kevin: We have a downloadable template for creating your marketing kit, video interviews with all the authors – what else do we have Mark? Mark: Don’t forget the eBook. 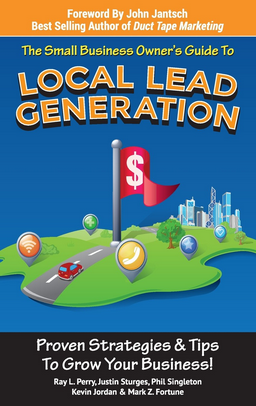 We put an eBook out there with 66 lead generation tactics and tips that you get for free when you go to the purchase link on localleadgenbook.com. John: Awesome. Well, thanks guys. Obviously, you’re in the Duct Tape Marketing Network so I will see both of you probably sooner than later, but congratulations on the book and obviously local businesses, this is information you need and it is in a very digestible format and great job. Kevin: Thanks John and I want to finish up with one additional quick story. I don’t know if you remember, but the first time that I met you, it was after you gave a speech to our local Small Business Development Center and I walked up to you and asked you to sign my book. It was The Referral Engine book. If you had told me at that point that in less than three years you would be writing the forward for a book that I wrote, I would have told you that you are absolutely crazy, but here we are and it’s happening and you’ve given us a lot of support not only with the Duct Tape Marketing Consultant Network but just in resources and access to the other things that we need so thank you very much for that. John: Well, you’re welcome. The need for what we do is immense guys so, you know, it’s a lot of fun doing this. I do remember that Kevin by the way. The nearest town that had an airport I think was about a hundred miles. John: That’s how small we’re getting. All right guys take care and we’ll talk to you soon.